The key to good style is in the details, and what better way to bring this to life than with your accessories? The trick is to master which pieces pair well together. Does this belt work with this tie? Will these shoes go with my outfit? Are my socks too loud? An essential part of getting dressed is knowing how to pick the right outfit-completers. It’s not as scary as it sounds. Get ready to go from accessory-zero to accessory-hero. As a general rule, your leathers should match—black leather boots, black leather belt. This goes for suede, patent leather, fabric and so on. If your look is on the dressier side, a leather belt is your go-to. If you’re wearing sneakers and jeans, a fabric version (canvas is a good choice) is easy and allows you to experiment with brighter shades. 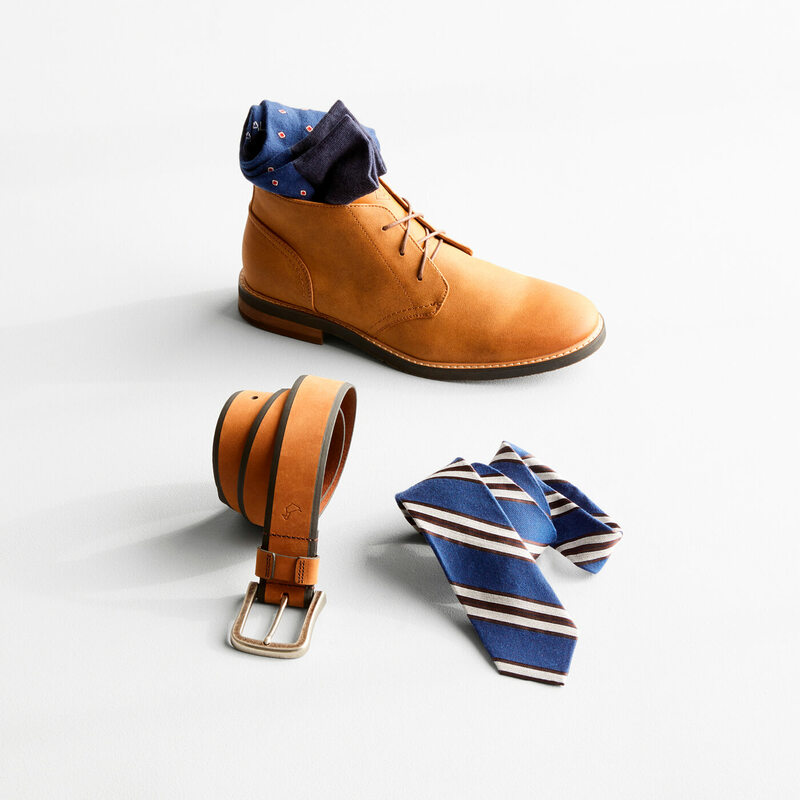 Quick Tip: You’ll get more wear out of accessories in traditional colors such as black, various browns and navy, since they usually go with most things in your closet (even a bold floral tie). 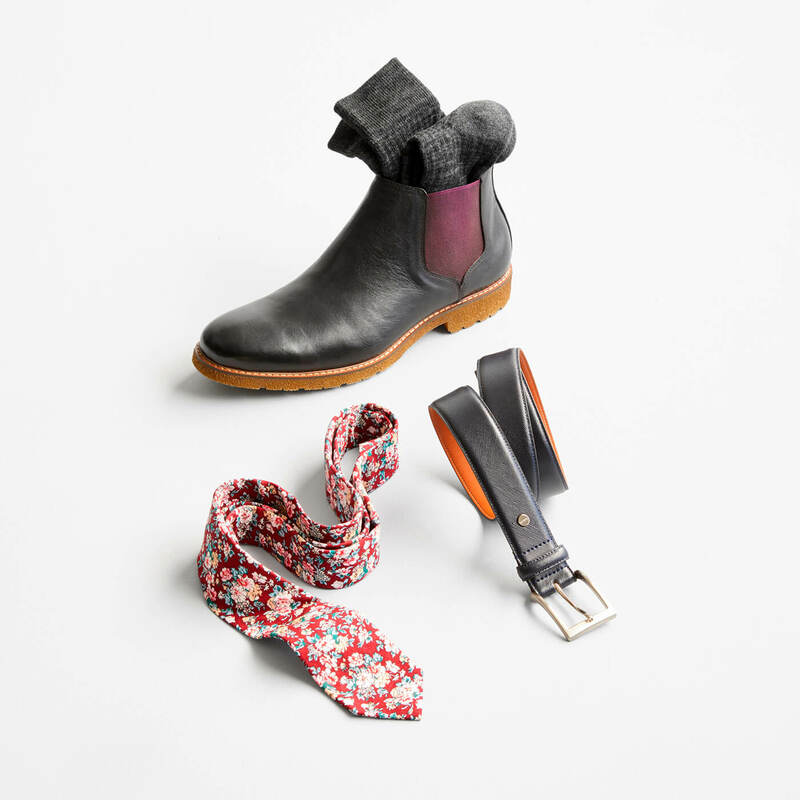 Now that you’ve got the belt-matching-shoes rule down, it’s time to add on. When adding a tie, pocket square, socks, or all three, a great place to start is with colors that work well with each other. One no-fail color combo is blue and brown, which you probably already wear a lot of separately since each has a huge range of shades. These two colors contrast each other harmoniously at every degree: dressed up, smart casual, casual. Quick Tip: Contrast is almost always the answer to the question, “does this match this?”—if your tie is always a shade lighter or darker than your suit, you’re golden. A hint of pattern is the easiest way to switch up the everyday, and since a tie is front and center, start there. With so many patterns to choose from, you’re bound to find one that speaks to your style and personality. If the pattern is loud, the rest of your look should be quiet. Pay attention to scale when you start mixing—a low-key, small scale gingham shirt will fade in the background of a prominent striped tie. 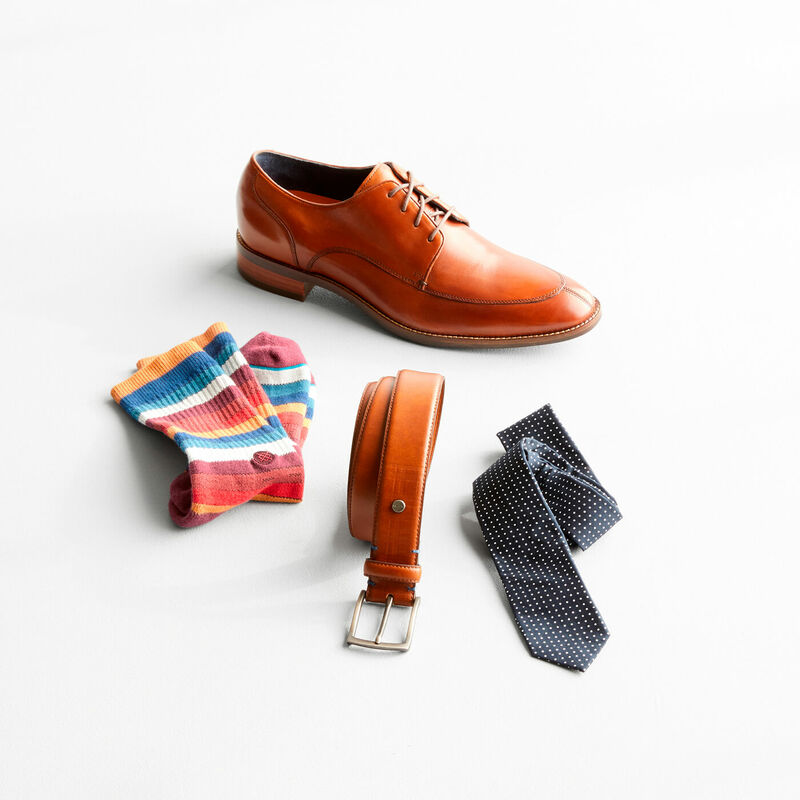 Quick Tip: When it comes to socks, decide if the occasion allows for something bright, always go with a classic pattern (stripes, argyle, dots), and keep the rest of your look chill when starting out. When in doubt (there shouldn’t be any now that you’ve got the rundown), keep it simple. If your look is starting to feel excessive, take away or tone down a few items. Less is definitely more when it comes to adding accessories—it could get wild. However, style is determined by the individual, so if more is your thing, we say go for it. If you have questions or are ready to execute, ask your Stylist for either or both.